I'd been putting off writing this post until my content planning was all finished and perfect, but I've realised that it's a constantly evolving process, and that it's probably the same for you. Plus, point 11 of my 2018 freelance manifesto is all about being an antidote to the fake perfect lives people share online, so I'm going to show you a snapshot of exactly where I'm up to now. I was determined not to miss out on opportunities this year, and so last November I attended an event run by Janet Murray, called Your Year in PR. Whilst some of the focus was on getting press coverage, a big part of it was thinking more strategically about your content and being prepared in advance to publish at relevant times. One of the many goody bag items that we received was a lovely "Media Diary" pre-populated with lots of key dates and awareness days. However, most of you have probably realised by now that I'm very much a digital person, and I knew that if the information stayed on paper, it would get forgotten about. I've talked about my love for Trello before, and I had previously tried to use it to create a content calendar, but just couldn't quite get it right. I had a gut feeling that this time, I'd be able to make it work, so I sat down and researched what other people were doing, and had a play around until I found a structure and process that I felt would work for me. If you're just reading that last section and wondering what Trello actually is, let me catch you up. I suppose I'd call it a project management tool, but really it's just a flexible way of storing information. I do use it for managing projects, but also for creating holiday itineraries, setting goals and of course, planning my content. The easiest way to explain it is to think of it as a digital version of a noticeboard or whiteboard with post-it notes on. Imagine you've got a few boards, each for a different project. You then add your post-it notes to the board, each one being an action, idea or reference point. So you've got a board and you've got your post-it notes on there, but you also probably want to organise them into a logical order, for example grouping them into columns or lists. On Trello, you have boards, lists, and cards. Cards are like your post-it notes except you can add lots more information to them such as images, links, comments or due dates. So you have your cards in a list, on a board. Like in real life, you can move your cards (or post-it notes) between lists and colour code them using labels. In case you're wondering, you can easily use Trello for free. There are paid plans aimed at nerds like me or businesses but you'll almost certainly not need them. You can also use it online, on your phone (the excellent mobile app is available for both Android and iOS users) plus they've recently launched a desktop app that you can use on Windows or Mac computers. Now you've had your Trello primer, let's have a look at how I've got it set up for my content. I've created a board called Content Planner, and I've starred it (just to the right of the board title). Starred boards appear at the top when you go to your Trello dashboard, so this one is always very visible, which is important for me so I don't conveniently forget about all the content ideas like I have in the past. It's like in a kitchen, you probably hardly ever use the appliances that are tucked away in a cupboard. I'm looking at you, ice cream maker. Next, because I like things to look pretty AND be functional, I've got a nice background image. You can add this via Menu > Change Background (click on Show Menu on the right if it's not visible). On the free plan, you used to be limited to colours for your background, but now they have a partnership with the excellent free photo site Unsplash so you can easily find a gorgeous picture to represent your project. This is the first list on the board and the information on here is taken partly from the Janet Murray media diary and partly from researching online. The Awareness Days website is a useful resource for the UK. I think it might try and ask you to sign up after you've looked at a certain number of events, but you can get around this by using Incognito or Private Browsing mode on your web browser. Each card on this list represents a particular day, and I've used Trello's due date feature to assign the relevant date to the card. The due date will turn orange in the days leading up to the due date, and then when it's past due it will turn red. For example, I'm writing this on the evening of National Pie Day and I had the due date arbitrarily set to 12pm, so it's now showing as overdue. For each card in this list, I also add labels to know which of my projects are most relevant to the day. For example, National Pie Day is most relevant to my Freelance Folk popup coworking events in Sheffield, as on the day of our event there's also a popup pie shop called Pie Eyed. I've therefore added the label "FF" for Freelance Folk, and you can select the colour too, so I've chosen one that makes sense based on the brand. It means I can easily see at a glance what I'm talking about when, and it also allows me to check if one project is getting significantly more content than another. Sometimes the key date or awareness day lends itself to a full blog post; other times it's just a simple social media post. As you'll see, I also have a checklist called Content Ideas where I write down how I could make use of this date. On this card, it's simply a reminder to promote the coworking session and piemakers, but it's so helpful to have this prompt otherwise I'd probably have missed the opportunity. Today, for example, a simple tweet about National Pie Day got me four new (really relevant) followers. Because my camera phone (and Dropbox backup from my camera phone) is mainly full of animal photos, I also found a nice pie photo I'd taken at one of our events so it would be to hand when I wanted to send the tweet. You can easily add images and other attachments to Trello and that's something I'd like to do in advance for all the relevant cards on this board so all the information is ready to go and doesn't require any extra brain power. Now, I'm an advanced Trello geek, so I have it set to automate my list Using Butler for Trello to move dates that have passed to the bottom of the list, and to set the due date to the same day next year. But on Trello it's really easy to drag and drop cards to move them, and changing the due date manually takes literally seconds, so don't be put off if automation seems a bit extreme for you! The next list on the board is where I store information about workshops I'm running or events I'm speaking at, along with any campaigns I want to run. For example, I'm running an event tomorrow at the Google Digital Garage in Sheffield so I created a card with the event date and time as the due date, plus in the description section I added useful information such as the hashtags and Twitter usernames to include, and a link to the event registration page. Under the description, you'll see that there's a list of Trello attachments. As well as image attachments, here you can also add links to other Trello cards or boards. This is a really neat little feature! So I have a card on my Blog Posts list to write about how I use Trello to plan my content. I have then created a link to that card within the separate Sheffield Digital Garage Trello event card. Yes, it's all getting very meta. As you may have noticed, I had planned to write this post a couple of weeks ago so I could use it to promote the event but that didn't quite happen. But hopefully you can see how it's starting to come together, and I'm able to link related cards to each other using that attachment feature. I'm also going to add labels to all the cards on this list, as another Trello feature is being able to filter your board by labels, so if I wanted to see just the cards that related to The Wheel Exists, for example, then I'd filter using the label TWE. To access this filtering feature, go to Menu > Filter Cards. If you run regular events and want to have cards for each individual event, you have a few ways to approach this. Trello has an option to copy cards (on the right hand side under Actions when you've clicked into a card) or if they're not too close together you could simply change the due date after each one has finished. The other option is to use one of Trello's bonus "Power Up" features, which allow you to add extra functionality to your cards and boards. If you go to Menu > Power Ups and then look under Automation you should see one called Card Repeater. I've not used it personally but it's made by Trello themselves so should be easy to install and set up. At the moment, this list contains both future blog posts that I plan to write and blog posts that I've already published. I may change this in the future to have two separate lists, one for new posts and one for existing ones. The benefit of having all blog posts on here is that I can create linked cards within relevant campaigns, events or awareness days. For example, one of my cards in Key Dates + Awareness days is for the 31st January when freelancers have to submit their Self Assessment tax returns. As finances will be a hot topic on this day I've got two blog posts planned; one for The Wheel Exists where I'm going to share how much I earn and talk about my personal approach to finances, and one for Freelance Folk with advice on creating good financial habits as a freelancer. I've created Trello cards for both of these articles in the Blog Posts list, and then linked to them from the card in Key Dates + Awareness. 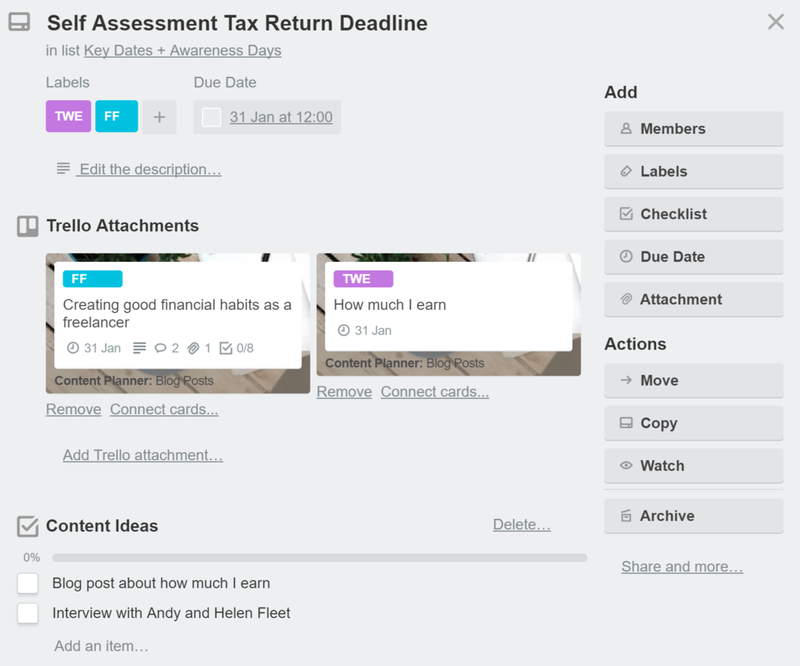 The cards in the Blog Posts list are where I really make the most of all the different features available in a digital tool such as Trello compared to having post-it notes or even entries in the media diary. I can collect all of the relevant information into one place and it's there on my phone or my computer whenever I want to add to or update it. I'm also going to have a look around for some good images to use so again, I can have those ready in advance and writing the blog post is more of an assembly job than one which requires many hours and lots of brain power. 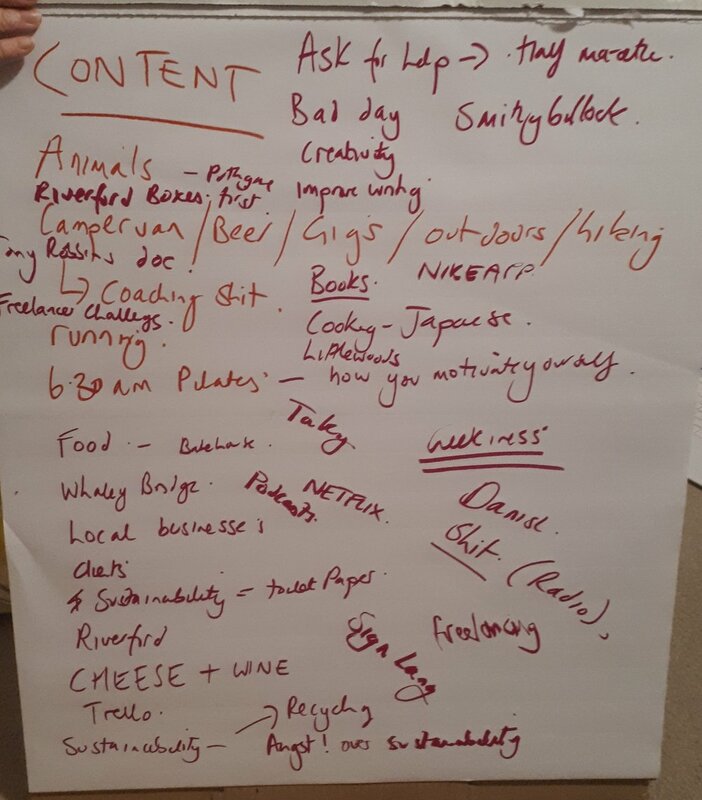 This is the least developed list on my content planning board (actually it was empty until literally 24 hours ago) but my plan is to put together an outline for social media posts including ways to repurpose existing content, another tip from the Janet Murray event. For example, I'd like to take the 12 points that I covered in my 2018 manifesto and talk about each of them in a bit more detail on the various social platforms. I considered doing monthly themes but I'm worried that might restrict me a too much, so instead I'm going to have almost like an "ideas bank" that I can choose the most relevant topics from. If you're a regular reader of my blogs then you'll be familiar with my freelance friends Michelle and Katya and they're a great source of ideas and inspiration for me. Last night we were round at Katya's and she was doing a trial run of an Instagram course she's preparing, so we got to do a brainstorm of topics that Michelle and I could share on Instagram. These are going to be typed up with one card per topic and I'll probably try to match them with some images too, as I've realised that I only tend to use photos once, when really they too can be repurposed. My ideas are in the bottom half, other than "Animals" which was my first suggestion! These two final lists came about because I realised that there was all of this content about me out there on the internet, but I was forgetting about half of it. Even prior to the Janet Murray event, I'd got a reasonable amount of press coverage including a mention in the Guardian and the Financial Times and yet I've probably shared the links to those articles like two or three times ever! And believe me, they are A BIG DEAL. I've also written about as many guest posts for others as I have blog posts for myself, and yet I was barely mentioning that whole other bank of useful content as it wasn't there in front of me on my website. Now I think I've pretty much collated all the articles written by or about me, and they have their own Trello cards with a link back to the original article. Including my blog posts, this means I have around 30 articles that I can link to on social media. Many of these are "evergreen" content that I can just share every so often, mixed in with my more topical and spontaneous posts, and of course they give me extra credibility, especially the press coverage ones. Obviously in a content planning scenario, due dates make sense. But if you needed another reason to add them, here it is! If you go to the Power Ups section via Menu > Power Ups and search for Calendar, you'll see an option to enable a feature that will show you a calendar view of all the cards in that board which have a due date. This is a great way to see everything at a glance, especially if you have quite a few lists, and it can also help you to identify if your content is distributed evenly. Yes, to an extent. My content eyes were definitely bigger than my stomach and I overestimated how much I could produce, but given that up to now I'd written 14 posts in four years, publishing two posts within a month is definitely progress! I've realised that if there's a framework or starting point, I'm much more likely to create that content. Possibly because it breaks the process down into more manageable chunks, so rather than having to tackle the entire blog post at once, from idea to finished article, I've got a space to just jot down a few ideas or an outline as and when I've got the time and it kind of builds itself. The next steps for this board are going to include more research on publications (plus podcasts and events) that I'd like to be featured in, along with listing external content that's useful for sharing. Like Paul Jarvis. Ha! You thought I'd get through a whole blog post without mentioning him? Not likely. I'm going to be running a series of webinars around Trello over the coming months, and if you follow me on Crowdcast you'll get notified when I announce new events.